This morning after a late breakfast, we walked downtown, taking along the fire extinguishers from the galley and the salon... they need to be checked annually. We dropped them off and then did a bit of shopping... found some awesome looking strawberries on sale for 99 cents per pound - wahooo! So had to get 2 pounds, of course. We picked up the fire extinguishers and made our way back to the boat - about 80 minutes of actual brisk walking... and then I prepared our favorite lunches. That means noodles in chicken broth and veggies (green onions, carrots, snow peas) for The Captain, and a huge strawberry and spinach salad for me... with mushrooms, almonds and fat free raspberry vinaigrette. And I experimented wih that microwave muffin that I made yesterday... adding cocoa powder to the mixture... and came up with this for our afternoon snack. That is Balkan-stye yogurt with a bit of vanilla and sweetener mixed in. Mmmmm. and repeated the whole works 3 times. I think it took about 15 minutes. And I made sure to stretch my shoulders and triceps and chest afterwards. I can feel it now a few hours later so I must have woken up some muscles. Good. The Captain is always amused when I do my workouts inside the boat as space is so limited for this kind of thing... he needs to be careful to stay out of my way! I got the details for my plank challenge today and am going to review them tonight so I can start working them in into my rotation. Thanks to Jill at One Tough Cookie and a Beer for the plank challenge. 5 km, 10 km. 1/2 marathon, marathon, ultra marathon... why not 5 mies? or 10 miles? 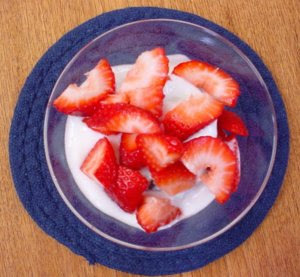 I know I could put strawberries on cereal at breakfast, and make smoothies with them, but I wonder if there is anything else I can do with them? What to do with strawberries--I put them on salads and on sandwiches instead of jelly, in oatmeal and yogurt. 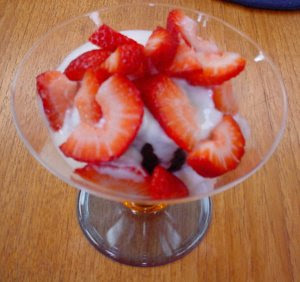 I also microwave them a little on low and add them as a compote of sorts for desserts. Yum! I will have to look up the plank challenge, I love a good challenge! 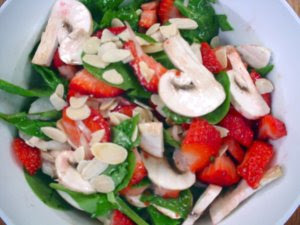 Your strawberry salad looks delish!